The Nashville RollerGirls will have their last home bout of the year at Municipal Auditorium on Saturday, September 10 starting at 5:30 p.m. This has been a great year for the team who have set records for attendance and appear to have a good shot at the national tournament for the second year in a row. The season's last doubleheader at Municipal Auditorium, 9/10! 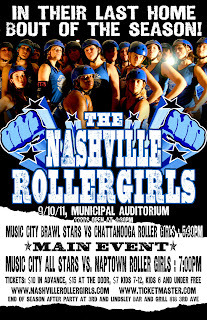 The Chattanooga Roller Girls face the Music City Brawl Stars at 5:30 pm and the Tornado Sirens of the Naptown Roller Girls from Indianapolis take on the Music City All Stars at 7 pm in the last home bouts of the 2011 season at Municipal Auditorium. Chattanooga and the Brawl Stars have played some of the same teams this season. Chattanooga skated against Burn City in August and came away with a 120-82 win. In comparison, the Brawl Stars July 16th match up against Burn City gave the Brawls their largest win to date - 261 to 71 with a win for the Brawls. Chattanooga also skated against the Little City Roller Girls from Johnson City this past June and lost by a small margin, 86 for Little City to Chattanooga's 84. The Brawl's April bout against Little City ended with Nashville taking home the win 108 to 88 in the last few minutes of the bout, but most of the bout was a close match-up. After their narrow loss in only the last few jams of the game to Carolina on 8/13, the Brawl Stars are hungry to end the home season with a victory. Interestingly, Naptown (17 in DNN's Power Rankings) has seen some of the same teams as the Music City All Stars (25 in the Power Rankings) this season as well. The 2011 season started up for Nashville with a trip to Cincinnati on 3/26. Cincinnati's Black Sheep took away the win that day with the final score being 176 to 65. The All Stars were definitely working out some kinks just coming out of the off season. In contrast, just a few weeks after Nashville visited Cincinnati, the Tornado Sirens were in Cincy for a bout and beat the Black Sheep handily, 167 to 94. The Minnesota All Stars are another team both Nashville and Naptown have played this season. Naptown's game against Minnesota was on 4/2 and the Tornado Sirens came away with a loss, 95 for Naptown to 111 for Minnesota. In contrast, the Music City All Stars lost to Minnesota on 7/16, 130 to 84, although the score was back and forth for much of the game. The All Stars have been focused on ramping up their game after their exciting win against Carolina on 8/13 so the match up against Naptown is sure to be intense. Tickets are $10 in advance at local ticket vendors or from your favorite rollergirl, $15 at the door, $7 for kids 7-12 and kids 6 and younger are free. Nashville RollerGirls Documentary Needs Your Help! A new documentary is being made on the Nashville RollerGirls and they your support to get the project off the ground. Here is a preview of the production and here is where to go to help. 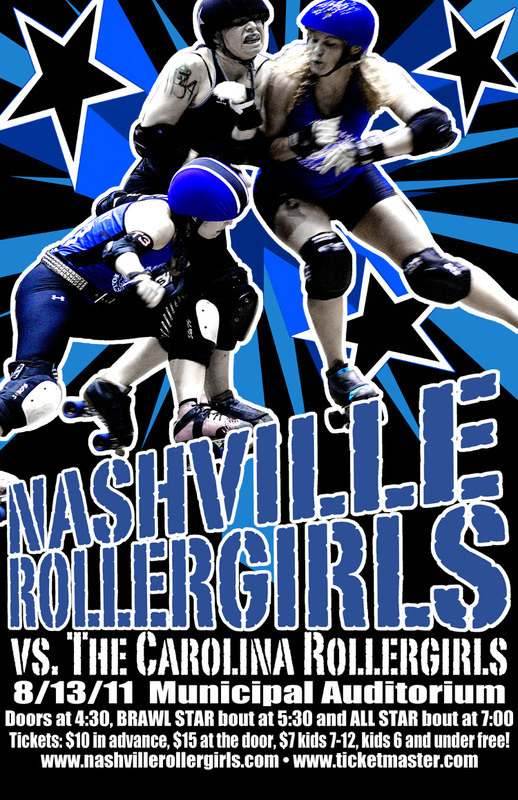 The Nashville RollerGirls return home for a doubleheader against Carolina on Saturday, August 13 starting at 5:30 p.m. Earlier this week they received their invitation for the WFTDA Playoffs so they should be flying high for the next bout. The Nashville Rollergirls at the Municipal Auditorium! Who: The Nashville Rollergirls are a group of hard hitting skaters who make up Music City’s all female flat track roller derby league. The games are fast paced, fun, and family friendly! What: In their 5th home bout of the 2011 season, the Nashville Rollergirls take on the Carolina Rollergirls of Raleigh, North Carolina. Watch your own Music City Brawl Stars open the evening against the Carolina Bootleggers. For the main event, the Music City All Stars will battle with the Carolina Rollergirls All Stars! Only two more chances this season to see the Nashville Rollergirls in action! Don’t miss superstar jammer Four-Leaf Roller, powerhouse blocker Lady Fury, brick wall Rock Nasty, and all the other fast and furious Nashville Rollergirls as they continue their 2011 season at the Municipal Auditorium. Tickets can be purchased at www.ticketmaster.com or at the door for $15. AUSTIN, TEXAS – The Women’s Flat Track Derby Association (WFTDA) announces that the Nashville Rollergirls earned a spot in the 2011 WFTDA South Central Region Playoffs. The top ten teams in the WFTDA South Central Region will head to Kansas City, Missouri, Sept. 30 to Oct. 2 to compete for one of three spots in the 2011 WFTDA Championships. The WFTDA South Central Region includes 27 teams hailing from a region that spans the southern states, from Florida and Georgia west to New Mexico, and extends as far north as Nebraska. The South Central Region Playoffs, nicknamed “Show Me Der-B-Q” this year, are expected to attract thousands of roller derby players and fans to watch some of the best action the sport has to offer. 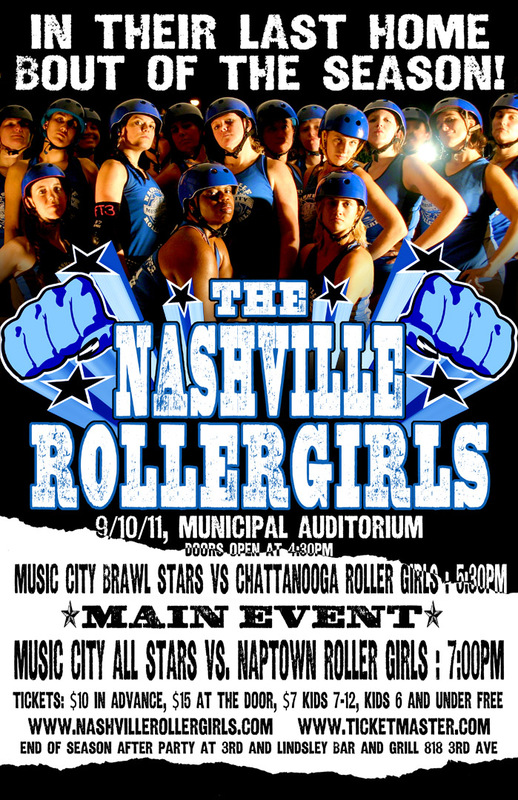 Fans wishing to cheer on the Nashville Rollergirls can find ticketing and other information at http://showmederbq.com. To make it to the Playoffs, the Nashville Rollergirls first had to earn a top 10 ranking within the South Central Region. WFTDA members vote on rankings quarterly, based on the results of a team’s bouts against other WFTDA teams. Second quarter rankings are used to determine tournament eligibility. As the third-seeded team in the tournament, the Nashville Rollergirls will first play the #6 seed, the Tampa Bay Derby Darlins, on Friday, Sept. 30, and will play at least three games over the course of the three-day, multi-level tournament. The top three finishers at each of the four WFTDA playoff tournaments will advance to compete for the championship title. Consolation brackets for teams that don’t advance in the Playoffs will help determine future rankings within the South Central Region. For more information on the WFTDA “Big 5” tournaments, see http://wftda.com/The-Big-5. The Nashville Rollergirls are a group of hard hitting skaters who make up Music City’s all female flat track roller derby league. Founded by local women in 2006, the Nashville Rollergirls were inspired by a resurgence of roller derby across the South. Skater owned and operated, the Nashville Rollergirls are a non-profit organization whose mission is not only to bring an exciting team sport to the city, but also to contribute to the community by supporting local charities and participating in community events. ABOUT WFTDA: The Women’s Flat Track Derby Association is the international governing body for the sport of women’s flat track roller derby and a membership organization for leagues to collaborate and network. WFTDA sets standards for rules, seasons, and safety, and determines guidelines for the national and international athletic competitions of member leagues. There are currently 117 WFTDA member leagues and 72 leagues in the WFTDA Apprentice program. WFTDA is governed by a five-member, volunteer Board of Directors and managed by an Executive Director. Here is the latest from the Nashville RollerGirls on their upcoming double header bouts set for next Saturday, July 16 at the Municipal Auditorium. Who:	The Nashville Rollergirls are a group of hard hitting skaters who make up Music City’s all female flat track roller derby league. The games are fast paced, fun, and family friendly! What:	The Nashville Rollergirls play their 4th home bout of the 2011 season at the Municipal Auditorium! Watch as your own Music City Brawl Stars open the evening against The Burn City Rollers, from Auburn, AL. For the main event, the Music City All Stars will battle with The Minnesota RollerGirls! Don’t miss superstar jammer Slammylou Harris, powerhouse blocker Slayla, brick wall Hildabeast, dynamo jammer Morvant Damme, and all the other fast and furious Nashville Rollergirls as they continue their 2011 season at the Municipal Auditorium. What: The Nashville Rollergirls play their 3rd bout of the 2011 season at the Municipal Auditorium! Fresh off a series of wins at the Honky Tonk Stomp in Knoxville, watch as your own Music City Brawl Stars open the evening against Chicago’s Shade Brigade. For the main event, the Music City All Stars will battle with Chicago Outfit Syndicate! Don’t miss superstar jammer Four-Leaf Roller, powerhouse blocker Slayla, brick wall Showstopper, new dynamo jammer Nix & Bruises, and all the other fast and furious Nashville Rollergirls as they continue their 2011 season at the Municipal Auditorium. Tickets can be purchased at www.ticketmaster.com or at the door.